Since April 4 my daughter Randi has been in the hospital with a severe case of pneumonia. (We actually started out at Express Care, they sent us to the local Emergency Room, and they sent her by Ambulance to a larger hospital about 45 minutes away from home). She started out on IV antibiotics. The doctors thought everything was improving but a chest X-ray showed that fluid around her lung had actually worsened. So last week they put in a chest tube to get rid of the fluid build-up. 2 days later she was having surgery to remove infected tissue from around her lung. During the surgery they discovered part or her lung was severely necrotic and ended up removing about 1/4 of her lung. She’s currently in Pediatric ICU . So we’ve been at the hospital since April 4th. I’ve been staying here with her every night and day. We are hoping there are no more surprises on the long road to recovery. I’ve had a couple knit and crochet projects with me here at the hospital, but honestly it’s been so chaotic with all the doctors and nurses that I haven’t done much, and haven’t really felt like it or been too tired most of the time. 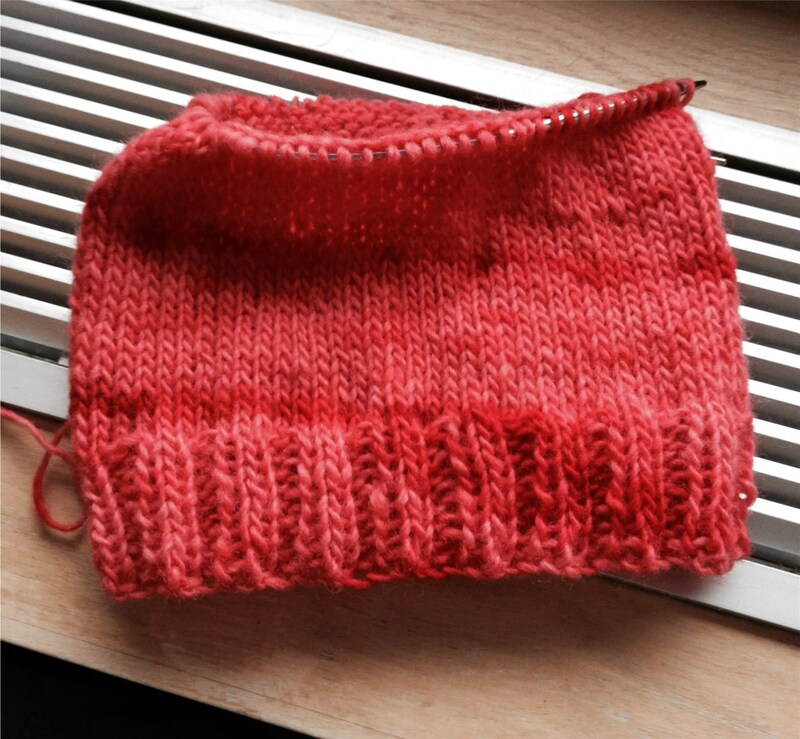 I did finally start knitting a hat the other night out of this hand-dyed wool from Blue Heron Farm. I think it’s actually the first time I’ve made anything with yarn that originated from my home state. I love the pink color. Maybe this project will help motivate and energize me to stitch some more. My mother started a fundraiser to help out with expenses related to Randi being in the hospital. If you want to check it out and/or contribute, just click on Randi’s image below. Any help and well wishes are appreciated. Thank you! This entry was posted in Knit and tagged The Randi Fund. Wishing you all the best, hope Randi continues to recover. Luna send you wags & licks, we will light you all a candle , as we think of you. Thank you! We have had some visits from therapy dogs here and have enjoyed those visits very much. Definitely one of the highlights of our time here. Give Luna a pat on the head (or her favorite spot) from both of us! I had a therapy dog at one time she just loved sitting with people. Luna on the other hand does not like other dogs & many of the people we meet ( or perhaps she’s just a good judge of character) I remember how the old people looked forward to our vista.